Most households have electronics today. Many of the appliances we purchase are not made to last very long due to wear and tear, or because people want the most updated version of the appliance. When we buy new technology for our homes or for our personal use we are left with old machines, most of which should not end up in landfills because they can carry hazardous material within their structure. Fortunately, there are places and events in our community that make it relatively simple for us to get rid of our old technology in ways that will not harm the environment and other humans. Some of the programs that are in place cost very little, are free, or even compensate consumers for properly disposing of specific appliances. The short newspaper article, “Best Buy Drops Recycling Fees” from 2011, mentions the electronic retailer dropping its’- $10 fee for (CE) items which include: televisions, cell phones, computer monitors, and DVD player to no costs (“Best Buy”, 2011). Without having to pay $10 for turning over their appliances, they can easily be properly disposed of without any cost. In 2011, Best Buy collected 83 million pounds of electronics and 73 million pounds of appliances, which is a significant amount of items that did not end up contaminating the earth (“Best Buy”, 2011). By 2014 the company hopes the number will increase, especially now that they have eliminated the fee. They expect the number to go up to 1 billion pounds by the end of 2014 (“Best Buy”, 2011). A common electronic device among us is the cellular phone. According to author Richard Dahl in his journal Environmental Health Perspectives, in 2004 Americans retired 100 million cell phones to switch to a new or different model, use different carrier, or because of a malfunction (Dahl, 2004). That is a huge amount of phones that could end up in a land fill one day. The University of Florida concluded in a study that cell phones can release enough lead, under test conditions, to be considered hazardous by the American government (Dahl, 2004). Because of this phone turnover phenomenon, companies have emerged that will take those old phones and will collect for fundraising drives (Dahl, 2004). The companies that collect the old phones will sell the old electronic to foreign carriers who will refurbish and resell, or recyclers who extract metals like gold, copper, and silver (Dahl, 2004). There is one company that took a large amount of cellular phone in the year 2004. RMC Communications Group took in about 80, 000 phones per month, and they offer their customers to take part in giving back (Dahl, 2004). People can feel even better about their choice to properly dispose of their cell phone, for not only have they prevented further landfill pollution, but also they have contributed to charity. In Schaumburg and the surrounding areas, there are a few places where residents can drop off their electronics and appliances. In mid-April of 2013, the Village of Hoffman Estates began a program where people could drop of a number of appliances for free (Free electronics recycling drop-off in Hoffman Estates). The flyer states that the event, which runs until November, is only for residents of Hoffman Estates – but it serves as a great example of how towns surrounding the Roosevelt University campus are taking part in electronic recycling and is a model for other towns to follow. In the beginning of the twenty-first century, legislators made efforts to reduce electronic waste in landfills, which were seeing an increase during this time. They worried that some parts within televisions and computer monitors would create an environmental hazard. 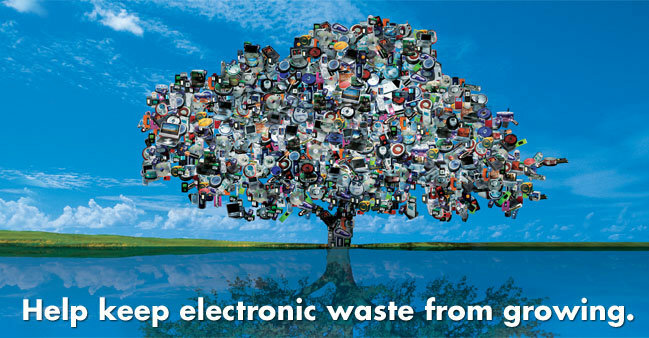 The journal article “Electronic Waste Control Legislation: Observations on a New Dimension in State Environmental Regulation,” by Major George J. Konoval, details why some parts in these electronics are a cause for concern to the environment and its inhabitants. Both computer monitors and televisions contain cathode ray tubes, which is a vacuum tube that contains high amounts of lead, and has a high amount of electronic waste in the past (Konoval, ). People should be concerned about properly disposing of their televisions and computer monitors because of the high levels of lead in the cathode ray tubes since they can potentially become harmful to our health. At the federal level, the EPA has put into practice programs that intended to encourage the process of voluntary recycling of electronics (Konoval, ). In comparison to action taken by the federal government, the states have been more aggressive on the issue of electronic recycling. Konoval says, however, that when states take their own action to protect the environment, the result are many different laws that conflict with one another (Konoval). This is true, for while doing research I found different articles from around the states with differing regulations. A federal law would eliminate the confusion and set the proper guidelines for states in order to bring a common legislature into place. Electronic recycling has come a long way since the early 2000-s, but there remains a long road to travel. For the time being, educating the public about the benefits of properly disposing appliances and how to go about doing so, is a major component. The communities near Roosevelt have done a great job in creating proper disposal in which residents and companies can easily get rid of their appliances, many times at no charge.